The Hot Pro 2.0 V-line utilizes a design that has been tested and proven to be effective in many tours. It features an improved version of Callaway’s White Hot Inserts to improve feel, sound, and performance. The putter also features Hi-Def Alignment, Perimeter Weight Placement, Full Shaft Offset and Oversize Winn Grip. 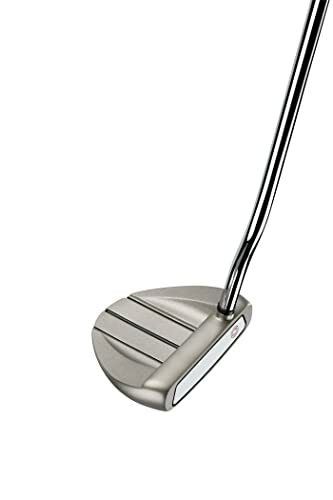 It is a unique mallet putter with a semicircular gray look, and the company gives it a sleek finish for durability and to reduce glare. White Hot Inserts: Callaway gives this putter a reengineered version of their tour winning inserts to improve the feel, sound and also the overall performance of the club. The company also uses a laser milling cutting process to achieve a tight tolerance that creates a consistent performance. Hi-Def Alignment Aids: The modified V-line alignment system on the topline eliminates guessing and promotes stroke consistency and increased accuracy. Perimeter Weight Placement: This putter uses perimeter weighting to increase responsiveness and forgiveness across the club face. Full Shaft Offset: The full shaft offset will keep the hand ahead of the ball through the impact so that golfers always get an upward strike. Grip: Odyssey Hot Pro 2.0 has an oversized Winn grip that not only makes it more comfortable on the hand but also helps to create a stroke that is more pendulum-like. 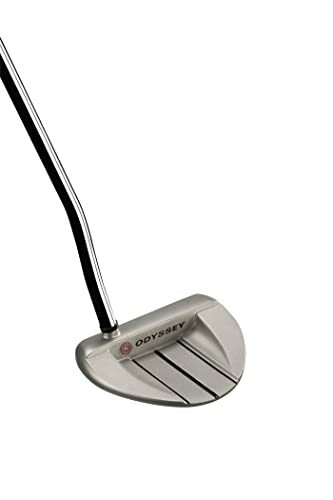 Look: This large mallet putter features a broad semicircular gray head, and it has a sleek finish that increases durability and limits the glare. The forgiving head will provide consistent and innate distances even on mis-hits. Three-line alignments aids ensure that you never have to guess when aiming. It is a very smooth and soft putter that will glide through the ball effortlessly. The design ensures that the head stays stable for different stroke types. It had a full shaft offset that keeps the hands ahead of the ball for an upward strike. Sleek finishing minimizes glare and also enhances the durability. The unique mallet head design ensures that you always get a proper alignment. It has an oversize grip that will create a stroke that is more pendulum-like. Some golfers complain that the sound and feel at impact can be too muted and soft. For a few others, the head will also look too big over the ball. A larger grip would be better. The Hot Pro 2.0 V-Line uses a new version of Callaway’s No 1 insert to ensure that golfers get a consistent sound, feel and improved overall performance. This head is very forgiving, and you can always be confident of getting the ball near the hole even on mis-hits. And the best quality about it is that you will never need to struggle or guess when aiming since it has three-line alignment system to help with this. There are many other advantages that you will get from using this putter, and they explain why it is one of the most popular ones from Callaway. 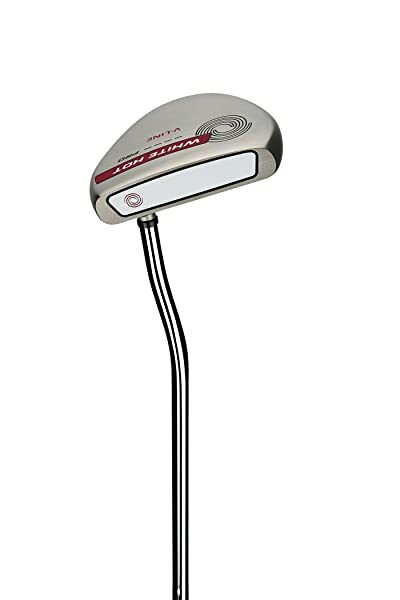 And with almost nothing negative to say about it except for minor issues like a muted sound, the bottom line is that it is a top notch putter that deserves a spot in your golf bag.